Is Virtual Reality a good substitute for real-life training for engineering applications? Virtual Reality (VR) is a barrier-breaking technology which allows complete immersion into a virtual environment, letting communication of ideas be easily and economically undertaken worldwide. 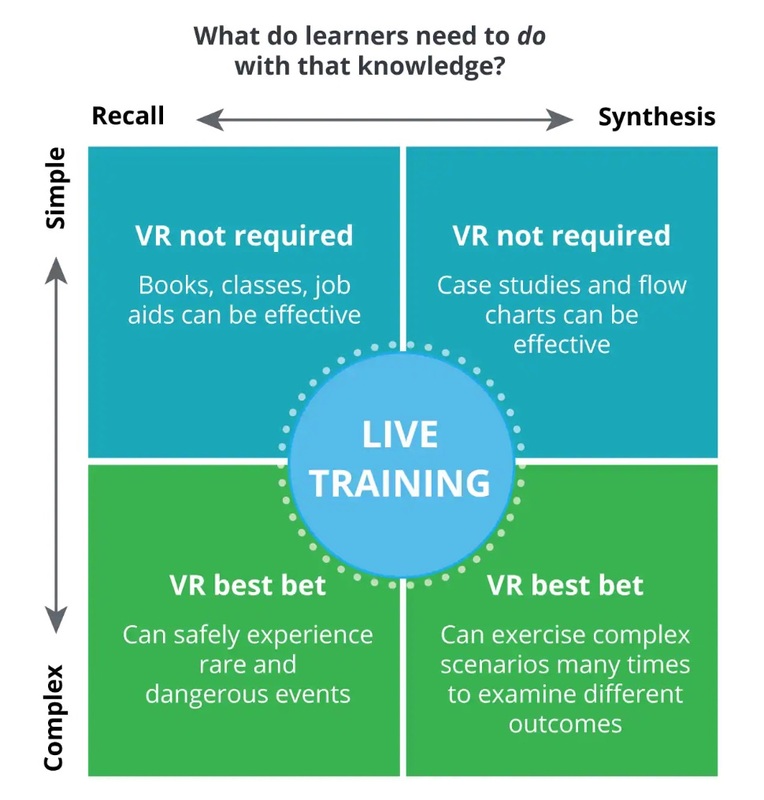 The usage of VR within engineering in particular provides a competitive advantage within the training sphere, allowing previously dangerous and costly instructional processes to be undertaken much more safely, cheaply and from anywhere. However, the technology is still in its early stages of development and could pose unforeseen risks if integrated into the workplace. The technology itself and its inclusion within an engineering environment will be explored to form a conclusion as to whether or not it is a feasible option. The level of training required for engineering applications may be high, as the impact of failure can be catastrophic. It is important to consider the uncertainty that comes with utilising VR technology before deciding its usefulness. If a company like Elekta, a radiotherapy device company, were to adopt VR to train assembly and design engineers, can it be guaranteed that all dangers are represented in the virtual world? Is the technology developed enough to give an accurate demonstration of how processes would be in real-life? Can such field engineers feel 100% confident they are delivering a fault-free system if they are training in a virtual world? This touches on the important issue of virtue ethics: whether or not the individual implementing a solution believes the solution itself is morally right, or more specifically, will not ultimately fail in a real-life situation. Although using VR is a cutting-edge, exciting technology, using it for educational purposes such as this will not accommodate to everyone’s style of learning. Only 15% of the population are kinaesthetic learners1, and so VR is clearly not the most effective method of training for most people. The utilitarian view that new solutions must produce the greatest good for the greatest number of people is contradicted here: should a solution that benefits a greater number of people be used instead? It is often difficult for engineering companies to adopt completely novel technological procedures as a lack of trust is present. Why should a company change how they train individuals if the method currently used is already efficient and so well-ingrained into company culture? VR may not be the best choice in this case, where the majority would prefer alternate existing solutions. Utilising VR for training may lead to the loss of jobs of teachers and trainers, reducing job security. The poor virtue ethics involved in implementing such a solution proves detrimental for those in the training and HR sector. As it is such a new technology, the long-term health damage inflicted on users of VR is currently unknown, but there has been indication that it could lead to eye or hearing damage. VR could lead to myopia or short-sightedness2, and long-term eye growth impacts are uncertain. Children and young people are most at risk from this and subjecting them to this technology without knowing fully its impact is seen by many as immoral. The technology can affect the eye-brain connections, and can cause eye-strain, headaches and nausea, sometimes called cybersickness3. This means that VR may not be suitable for those with pre-existing medical conditions, failing to meet Kant’s principle of universality: that for an action to be acceptable, it must be possible to apply to all people without any contradiction. Utilisation of VR within training can prove massively beneficial from a safety perspective. VR provides a safe environment for beginners to practice their skills until they are confident enough to apply these in the real world; they are more likely to make mistakes during training. Decreasing the exposure of inexperienced trainees to unsafe environments such as those in the oil and gas industry ensures the virtue morals of an engineering company are upheld, as fewer unsafe and costly scenarios will take place. This provides much safer and lower risk training procedures overall. With the engineering industry having such high-risk applications, shouldn’t this be adopted by everyone? With respect to office and data manipulation training, a much more visual training experience is made possible with virtual reality. Presenting subject matter in an appealing 3D format improves ability to retain knowledge more effectively, this being essential in a population with 65% being visual learners4. This technology is developing rapidly and becoming suitable for high-risk engineering purposes, for example nuclear power5. VRgineers is a company who have built a VR headset with engineers in mind, to ensure they get all the benefits from the device they require for their applications6. With technological advancements going in the right direction, getting involved with VR appears to be the next logical step. VR reduces or completely removes the need for travel, supervision and physical equipment costs of training procedures7. Monitoring the progress of these practices using VR provides benefits not otherwise seen in real-life variants. The speed of learning and quality of work from new recruits will improve due to the provision of comprehensive feedback. These provide an overall long-term cost benefit to engineering companies despite the high initial equipment costs. Mitigation of these costs means that companies will have more disposable income to use for employee benefits and innovation, supporting the universality principle of a company, as all employees will see some benefit from the effective use of technology. Utilising a learning platform using technology which many already use for social and entertainment purposes provides a competitive advantage. Trainees who are familiar with VR technology will see training as something more enjoyable and will already know how to exploit it to great effect. This will encourage those more apprehensive to engage with the technology, employing Kant’s theory of universality. VR provides many benefits within the training sphere, specific to certain applications. The image8 above shows in which circumstances VR might be appropriate. However, many are apprehensive, particularly within engineering. Therefore, partial implementation of VR to augment existing methods seems like the most optimal solution as this current point in time. In your opening paragraphs you don’t make the ethical dilemma clear. Why should we use VR, why shouldn’t we? I’m not fully clear on what the principle issue is, perhaps in Assignment Two you can clarify this for me. The ethical issue faced discusses whether or not the unforeseen long-term risks are worth the short term benefits made clear within the article. Is it worth risking people’s jobs and the health of users for a solution to a problem which does not necessarily exist? Another principle is that the technology only targets a fraction of the engineering industry, limiting its use for non-kinesthetic learners and those with mobility issues. Is this a worthwhile technology to attempt to implement into the wider engineering industry? This is an interesting prospect. Have you considered the possibility of VR also being suitable for low complexity safe scenarios, for example, getting trainees used to identifying components from CAD files and their uses pre-production? By training before production lines are up and running you could kickstart development. That is definitely an important point to consider. However, it needs to be evaluated whether or not investment in the technology itself will be worth it. It is unsure that the initial money used to implement the technology would pay off in the long term for applications like these where training is already relatively cheap, easy and mobile (can be done online etc). The point that only 15% of the population are kinaesthetic learners is clearly important for training, but maybe even more so for recruitment for which it seems to be increasingly used. In the short term this may save money for employers if it means recruitment processes are cheaper. But if it ends up rejecting 85% of candidates because they are less VR-friendly, rather than for their skills and strengths, then it will eventually benefit noone. An excellent point to consider especially considering the current trends in the field as you said. An only partial implementation of this technology would certainly be necessary in order to maintain utilitarian ethics within recruitment. VR is currently applied in Formula 1 racing , as a race training aid tool to help driver awareness and their split decision making whilst actually racing. The effect of using VR is successfully show in the reduction of accidents on the race track.